Hello, was looking to put on some more aggressive rear tires on my 1984 Big Red. I have been reading posts on here about how popular bearclaws are. I also see people say GBC Gators or Possibly Swamp Witches? Recommendations? Anyone of those tires to heavy and rob alot of horsepower? The rear tires i have on now are 25x12x9. Rocky Mountain doesn't appear to have that size. You are correct in assuming heavier and more aggressive tires will rob horsepower, because they will. It depends on your terrain as far as which tire would be best. 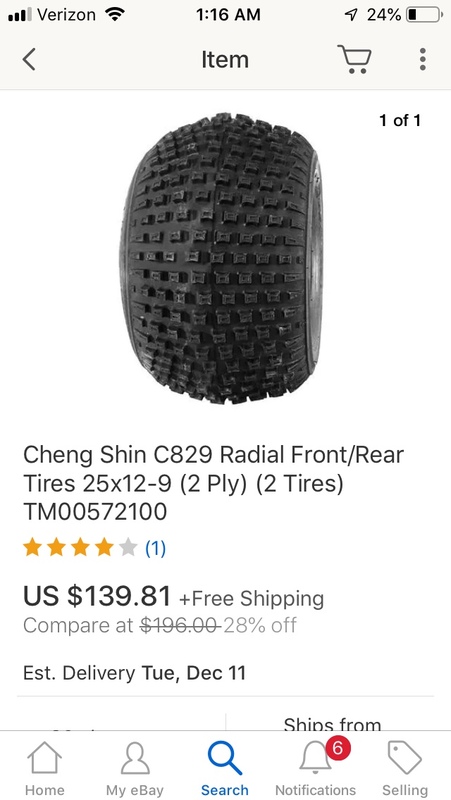 Here in New England, the OEM 2-ply tires or the closest thing you can find to them (Cheng Shin knobbies) are by far best. It is extremely rocky and rough where we ride and our tires are half of our suspension. A 4 or 6 ply tire is not going to have enough flex for us here to ride on comfortably. We all have rear suspension here too, but you do not. Therefore your tires are your entire suspension, not just half. If it's smooth enough where you ride that you can afford to lose the suspension 2 ply tires offer and you actually need more aggressive tires where you ride, then the meaty hard tires are for you. If you're getting them just because they look cool or something, they might bother your lower back depending on how the terrain is where you ride. This is what we run on our Big Reds, and the same thing in 22" version for SX's. Thx for the reply! That is good information to know. I currently have cheng shins on mine now and plan on keeping them. Looking for maybe a spare set if i ever go mudding. Here are a couple pics of it. My goal is to also add a ATC 200M fork setup for the front here very soon since my shocks are seized in the front. The last picture is what my Big red looked like when I bought it. Last edited by MN250R; 12-06-2018 at 09:16 AM. Have personal expernce with a 250es running 25in highlifter outlaws (the old/first design which if I recall correctly is a 2 ply tire). Light enough and soft enough for a 3 wheeler, but super agressive for any mud/clay situations. Not ideal for sand, but does pretty well. Hard surfaces it's a bit of a ruff ride though. Small downside to the tires is the 12in rim size. The knobbies do pretty well for general use, and 3 wheelers are light enough to push though stuff pretty easy anyway. Also these rear tires on my 350x do pretty well overall. Haven't gotten into anything too nasty with them though, seem to do quite well in dirt/sand though. I took it down the drag strip a few times at trike fest and was wheeling most of the way down the track with my weight over the front tire. I can grab the name off them if you're interested in them, they are 22in on the 350x but maybe they have a 25in version. Also the tires are reversable for mud vs sand. If I recall correctly, the way they are installed in the pic is for mud (for clean out), and the opposite way is to act more like a scoop for sand. Nice 350x! Ya, my buddy has realtors on his banshee. Ill have to check those tires out also. Alot of good information here. thx for all the replies! No prob, yea that's my "pretty" machine that never is rode lol. I have to replace the timing chain on it and the carb floods over, have one that should be bolt on ready to go in the house, and the clutch has a bit of an issue. My rider 350x has the rear tires on it though and is ugly but no super major issues lol. 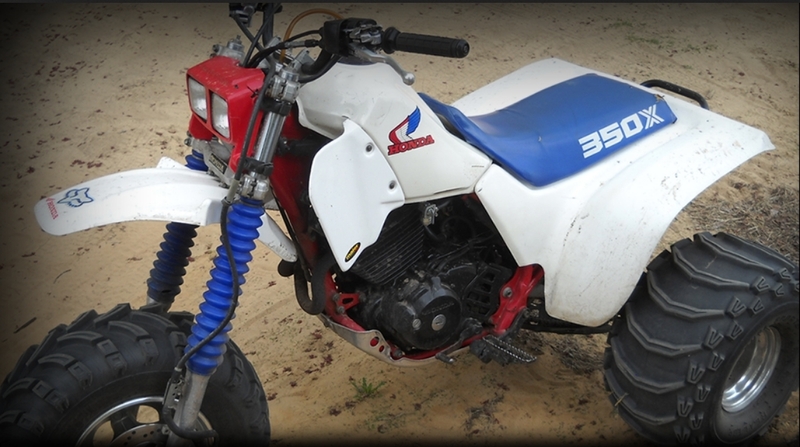 Added photos of the rider 350x when I first got it, I replaced the engine on it and the tires. Have a few more things to do like replace the bent fork and the front wheel bearing & steering stem bearings getting worn a bit. Seems like the last owner liked stainless steel. Air box lid and the scoops on the tank were stainless when I bought it lol. Have to love the bubble gum welds all over the exhaust/head. Was a pain to remove, had to destroy the head pipe to get it off the machine, have a DG overly loud exhaust on it now :-/. I have bearclaws on my sx. Theyre good tires for what they are meant for, but sure don't drift easily like most of the stock-type tires used on 3 wheelers. You notice the weight too. I only use my sx for that kind of riding though, and I have been happy with them. I ride my 350x when I want to drift, and it has less aggressive rear tires for sliding. look into Goodyear 25/12/9's. I believe they are a 2-ply. They are still heavy and not near as forgiving as the Duro's or Chen Shengs. They are tall beasts though. A good 1.5-2 inches taller than the 25 inch Duro. They look great and really dig in. Although i wouldn't recommend them if youre bouncing around a lot on tht harttail. I dont know how old you are, but your back will catch up to you in the later years. I will check them out! Thanks for all the replies from everyone! I have Bearclaws on my 84 200S. Thay can be rough riding, but then again it is a hardtail. I run them with about 2 psi in them. I had a 200S ............but i never would ride it .........i once rode a 350x ...........but i gots bored wit it..............Banshees are OK .........if you like being that fourth wheel ...........250R ? ?......thats more like it .........i like it !.........i like it Alot !! Just my 2 cents I have the cheng shin knobbies on the back of my 200m and my bike will go wherever my girlfriends families four wheelers with huge mud tires and four-wheel drive will and they get stuck but I do not. Thx for the reply! That is good information to know. I currently have cheng shins on mine now and plan on keeping them. Looking for maybe a spare set if i ever go mudding. Here are a couple pics of it. My goal is to also add a ATC 200M fork setup for the front here very soon since my shocks are seized in the front. Nice trike, man! In my opinion, the tires you are currently running are the best tire choice for that trike. I wouldn't change a thing if I were you..... well, except the front forks, but that is a problem for every 200es.